Despite low volume during the holiday-shortened week, markets pushed higher thanks largely to continued improving economic data domestically. 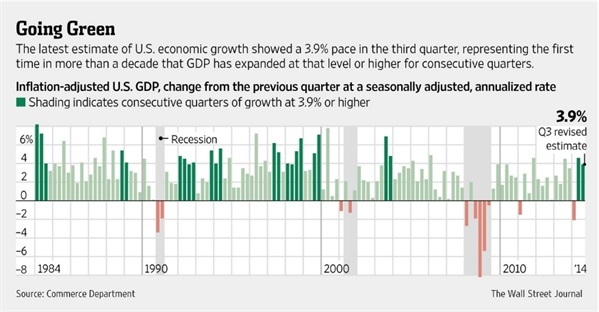 Gross Domestic Product (GDP) growth for the third quarter was revised up to 3.9%, which put the combined six-month rate at 4.25%, the best pace of expansion since 2003. This news propelled the S&P 500 to its 47th record close of the year on Wednesday (the index retreated slightly on Friday) breaking streaks set during the bull markets of 1998 and 1987. Two other factors are providing a tailwind for domestic equities: share repurchases and rising dividends. It is estimated that more than $130 billion has been spent each quarter to repurchase shares this year, the most since 2007. Moreover, nearly one third of companies within the S&P 500 currently provide a dividend yield better than the 10-year U.S. Treasury. Usually, only one in ten companies do. While Americans were enjoying turkey and cranberry sauce on Thursday, members of the Organization of the Petroleum Exporting Countries (OPEC) met in Vienna and decided to keep daily production at 30 million barrels. Following the announcement, West Texas Intermediate crude fell to $66 per barrel, down 13.5% for the week and to the lowest point in five years. OPEC has abdicated its role as swing producer in an attempt to protect market share since breakeven costs per barrel for its largest members are much lower than domestic shale producers. The shale boom has pushed U.S. production to more than nine million barrels a day and resulted in a two million barrel daily surplus according to some estimates. Debate runs high about the direction of prices from here. Some experts argue we are already near a bottom at $70, while others call for prices to move much lower. Microeconomics 101 reminds us that the long run price of a product equals the marginal cost of the cheapest producer in an environment with perfect competition. The oil market is far from satisfying this condition, but it provides nice food for thought given the world’s low-cost producer of oil, Saudi Arabia, can pull a barrel out of the ground for around $30. Is a Perfect Storm Brewing? Much has been said about the declines in oil prices and the benefits conferred to U.S. consumers and other energy importing nations. However, if the slide continues, it could present dangers in unexpected ways, specifically throughout the fixed income market. According to IHS, the U.S. exploration and production sector outspent cash flow by $272 billion, financing much of its growth by issuing debt. High-yield debt for the energy sector has tripled since 2008 to $210 billion. In fact, energy is the biggest sector of the high-yield debt market. 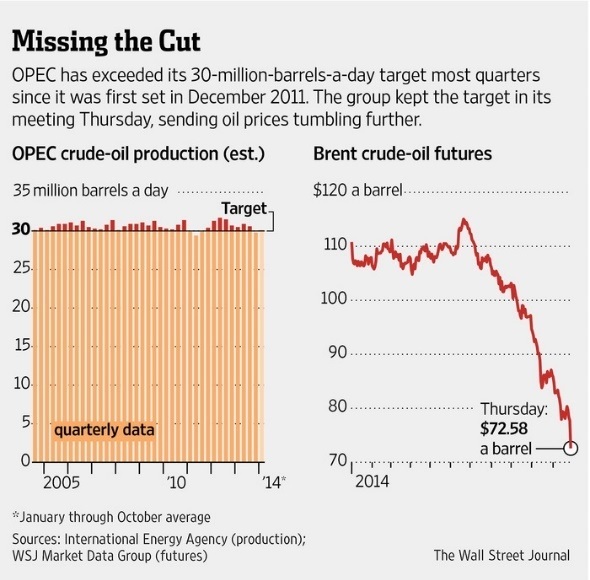 What happens if sustained lower oil pressures cash flow of already highly indebted oil companies? Last week, Mark Carney, Governor of the Bank of England, revealed an astonishing metric during a speech in Singapore where he said it now takes investors seven times longer to liquidate debt portfolios than it did just five years ago. Heightened regulatory changes and a reduced appetite for risk has prompted banks to dramatically cut inventory of fixed income securities, making it much harder to match sellers with buyers. We already saw a hint of this last month with the “flash crash” in U.S. Treasuries. Sustained lower oil prices and the increasingly scarce liquidity for fixed income securities could create a panic if investors decide to rush to exit en masse. Shopping malls were once the center of the American suburban universe, but more and more they are becoming abandoned or used for other purposes. Earlier this month the Wall Street Journal ran an article highlighting the trend of data centers renting vacant space within malls and filling it with rows of servers. Ironically, one of the daggers killing malls, internet shopping, could now help save them. This holiday season, malls look to two additional unlikely heroes to woo shoppers away from the internet: Uber and Elsa. 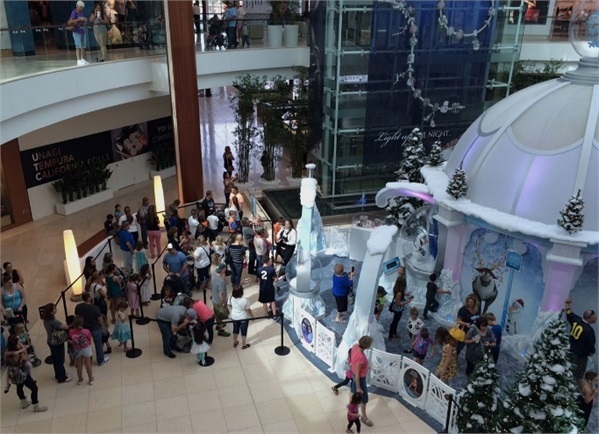 Frozen ice palaces are popping up across the country so kids can meet Anna & Elsa in addition to Santa. Some are also offering free Uber rides to and from the mall for anyone who spends a couple hundred dollars.